Here’s the thing about opera that those who don’t go don’t know: It’s a lot like rock and roll or art or the theater in that it’s not monolithic. When you go to the Art Institute of Chicago or the Musée de Louvre in Paris or the Metropolitan Museum of Art in New York, the array of what to see is vastly diverse. Similarly, there is abundant variety in what opera sounds like, what it looks like, how it makes you feel, what it makes you think about, where it takes you. It can be florid or utterly stark, traditional or modernist. It can be whimsical or shocking. It can be gleefully silly and escapist, sophisticatedly witty, gut-wrenchingly serious, allegorical, metaphorical, tear-jerkingly melodramatic, historically accurate, or infused with fantasy. And a whole lot more. In the right circumstances, it can compel more than 3,000 people to hold their collective breath because they’re so engaged in the musical and dramatic (or comedic) moment. You might have had a lousy experience seeing an opera in the past and sworn off the stuff, perhaps because you didn’t understand a word, and couldn’t bring yourself to care about a bunch of oversized stand-and-deliver singers in funny wigs. Try it again: it’s better than you remember, especially since virtually every opera company now provides projected English translations for every opera, even the ones in English. Before you get to the opera house, you can surf the company’s and countless other websites for easy-access background information and images. You’ll find that contemporary opera casts are increasingly age- and physique-appropriate, some singers are downright hot, and most of them can actually act, some of them really well. Forget the outdated stereotypes: If you’ve seen one opera, you so haven’t seen them all. And if you haven’t seen one, what are you waiting for? It’s not scary. It’s not boring. It’s not for just the elite or the aged. It’s truly a boundary-crossing entertainment. You, the reader of these essays posted on artsjournal.com, may already know all this about opera, in which case kindly pass it along. Or, you may not. There are plenty of classical-music aficionados who stay within the comfortable boundaries of what’s familiar, and for a fan of orchestral or chamber or piano or choral music, that doesn’t necessarily include opera. Trying anything new is always a risk; “What if I don’t like it?” you think, we all think, especially if tickets are expensive. But – what if you do? How cool is that, to have a whole new musical genre to explore and enjoy? That’s been my experience in 15 years at Lyric. I arrived knowing relatively little about opera, and have been listening, learning, and enjoying ever since. The operas I’ve found most compelling have generally been less-well known, and those are the ones I’m most inclined to encourage opera-wary friends to see. During the final week of Lyric Opera of Chicago’s 52nd season, I took two friends (on two separate dates) to Dialogues of the Carmelites, a work that defies most operatic conventions. The opera is based on the true story of the persecution and execution of 16 Carmelite nuns during the French Revolution’s Reign of Terror. Sounds grim, but somehow the mixture of beautiful music and the poignant narrative results in a powerful, unexpectedly uplifting night at the opera. One of the friends I brought to Dialogues, my retired high-school English teacher from Oshkosh, Wisconsin, is an occasional operagoer in her 70s whose daughter-in-law used to sing professionally; earlier in the season I persuaded her to come hear Lyric’s Salome with Deborah Voigt starring, even though she didn’t think she’d like Strauss. (She did, big time.) 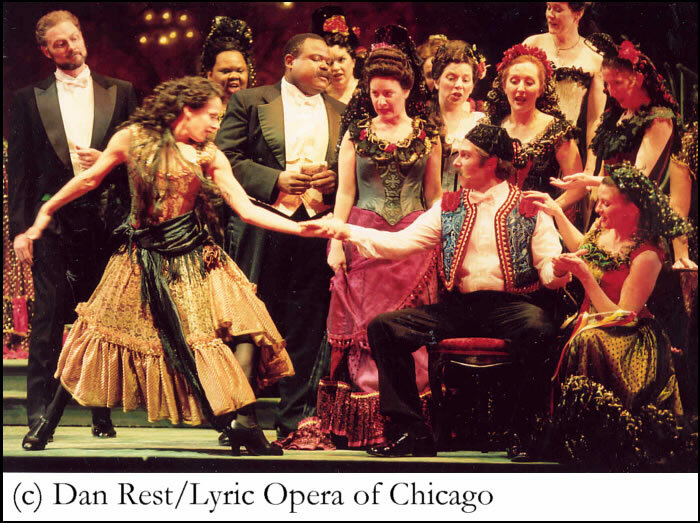 The other, a Chicago CPA and devout Catholic in her 50s, has attended only a few operas in her life. Early on there’d been plenty of tickets available; by the final week, the opera was virtually sold out – a testament to the power of the piece and the production. I knew these avid two theatergoers would find resonance in the drama of Poulenc’s masterpiece and the brilliant portrayals, and I knew the music would win them, as well. I emailed them articles, synopses, and reviews in advance, and generally talked it up out of a personal sense of mission. It was the first professional production in Chicago since the opera premiered 50 years ago, and who knows if we would ever again have a chance to see it staged at such a high level? Each of my friends was shaken and stirred by the opera, especially by the riveting performance of Felicity Palmer as Mme. Croissy, the ailing prioress who dies agonizingly in the first act. Was it a “typical” opera? No; there was no love story, no arias, no set pieces, no fancy scenery in Robert Carsen’s stark black-box production, none of the standard stuff one associates with opera. But we all came away from it enriched, deeply moved, and thoughtful. Sometimes what you take newbies to see depends on what’s available at the moment. A decade ago my mother-in-law and sister-in-law, who live in northeastern Minnesota and had never seen or heard any opera, ever, decided they wanted to come to Chicago, stay in a hotel, and visit my world. I recommended Puccini’s final work, Turandot, in Lyric’s pulsatingly colorful David Hockney production. Before the performance, we went to supper (along with my husband and seven-year-old son), and I talked them through the story very casually: there’s this princess in ancient China who’s scared of guys, so anyone who wants to date her has to answer these riddles, and if he doesn’t get the answers right he’s beheaded, and so far nobody’s gotten close to her, but then this guy, Calaf, comes along, and he gets all the answers and freaks her out, and eventually she realizes she loves him (after his father’s servant Liù kills herself rather than reveal Calaf’s name because she loves him), and that’s the story. They came, they saw, they heard, and they loved it. 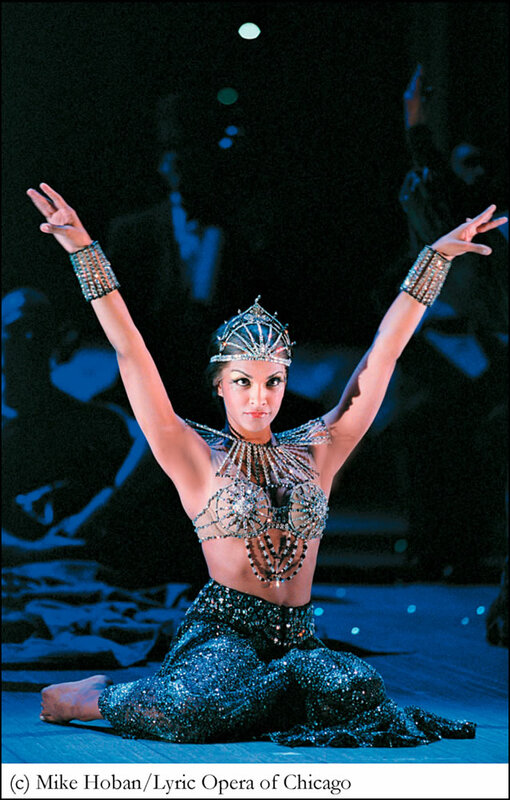 The music, scenery, and costumes were exotic and magical, and the story was graspable. Sharing a live performance with 3,500 others was something they’d never done, and they came away with a once-in-a-lifetime experience. Lyric’s student matinees are a sort of grand-scale take-a-friend-to-the-opera outing. On two March afternoons, more than 6,000 7th through 12th graders dressed in everything from high heels and bridesmaids’ dresses to sneakers and jeans giggled, shambled, gawked, and teetered their way into the Civic Opera House to see a fully staged production of Johann Strauss Jr.’s Die Fledermaus, performed in German with projected English titles. All their teachers had received study materials in advance, and each class had been visited by a volunteer lecturer from Lyric, plus many had previously been exposed to in-school opera outreach programs, and some had been on student backstage tours, so they were well prepped to visit the big house downtown. The gorgeous Art-Deco opera house did elicit lots of oohs and ahhs, and hundreds of cell-phone cameras and digital cameras were deployed before showtime. A few kids assumed that the opera would be dumb and boring; in print, the synopsis does sound pretty silly and dated. But once the lights went down and the show got underway, the kids were all right. In fact, they loved it, and laughed with genuine surprise and merriment at the pratfalls and pranks, the slapstick and schtick. The young cast totally engaged the young audience’s attention, and everyone left happy. Comic-book editions of libretti are a surprisingly good way for all ages to get a handle on specific operas. 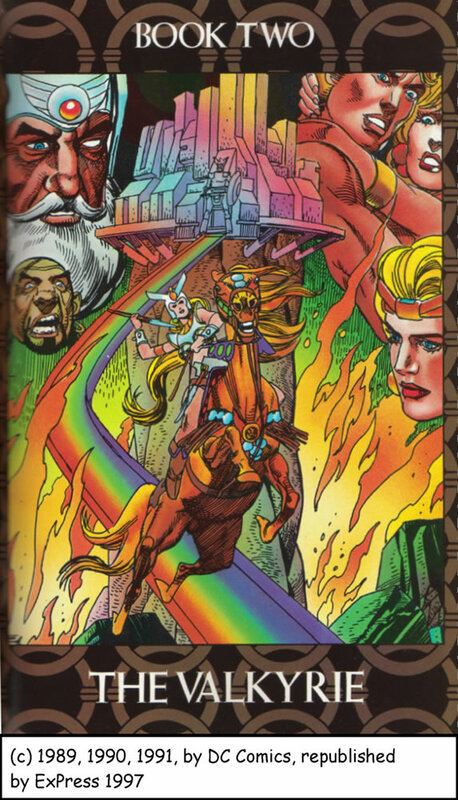 In 1989 DC Comics’ legendary Gil Kane and Roy Thomas collaborated on a graphic-novel version of Wagner’s Ring cycle that is astonishingly true to both forms. (Opera News magazine’s Brian Kellow wrote the intro.) Buxom maidens, musclebound youths, greedy leering dwarves, fallible gods, magnificent monsters – all are rendered in classic DC style with speech and thought bubbles directly quoted from Wagner’s turgid libretto. 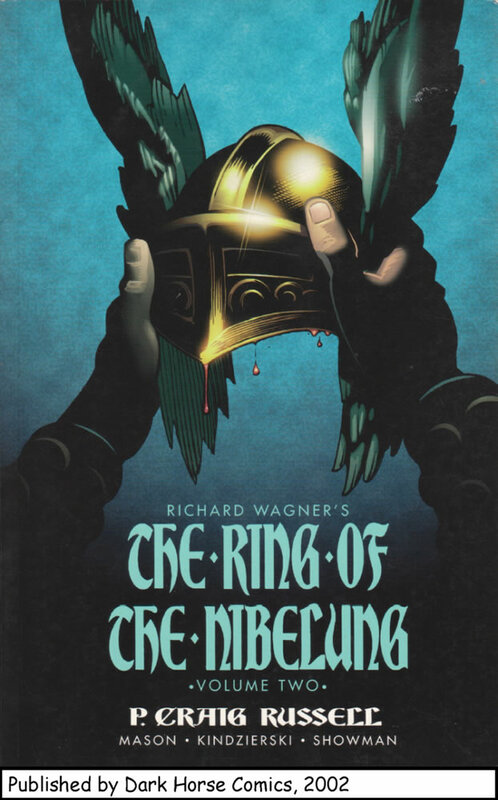 The comic-book Ring has the added advantage of graphically illustrating long passages of back-story, such as Sigmund’s recounting his adventures and trials before collapsing in the home of his long-lost sister and her brutish husband Hunding in Die Walküre. 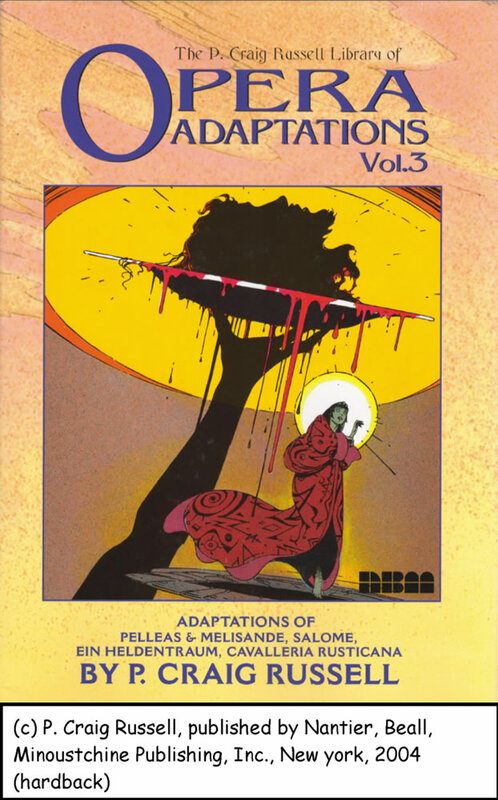 More recently, artist P. Craig Russell created his own two-volume comic-book Ring plus several graphic-novel versions of operas, including The Magic Flute, Salome, Cavalleria rusticana,Pagliacci, and others. Read any of them while listening to the corresponding opera recording, instead of merely following the libretto – it’s a great way to demystify the experience. Lyric Opera of Chicago is currently off-season, but the curtain will go up again Sept. 29, with new and familiar productions of eight classic and contemporary masterworks. Think of any opera company’s season as being a building with as many doors as there are operas in that season; each of the doors will lead the visitor into an experience of opera that is different from each of the other doors. Lyric’s 53rd season starts with two operatic blockbusters opening back to back: Verdi’s La traviata [pictured to your left, click to enlarge] and Puccini’s La bohème. Both are Italian mega-hits of the 19th century, both are set in Paris of the mid-1800s, both are beautiful to look at and listen to with lots of readily recognizable tunes, the stories are plausible, both are rich with romance, passion, misunderstanding, despair, and untimely death, and the casts are fabulous, guaranteed to astonish and thrill newcomers and veterans alike. What’s not to love? For anyone who loves ancient history, an intrigue-filled plot, sizzling power-couple coupling, breathtaking costumes, Bollywood-style showmanship, guys who sing high, and/or the pulsating energy of Baroque music, Lyric’s premiere of Handel’s Giulio Cesare (Julius Caesar) [pictured to your left, click to enlarge] would be a terrific intro to opera. It’s all about Caesar’s arrival in Egypt, his seduction by the teenaged queen Cleopatra, and the surrounding political machinations. The wildly entertaining and anachronistic production from Glyndebourne incorporates 1940s-style Hollywood and contemporary Indian production-number choreography, 1920s flapper costumes, 19th-century colonial trappings, a Bedouin tent, and other exotic elements. Plus, there’s the thrill of the countertenor title role. 20th-century composer Richard Strauss and his librettist Hugo von Hofmannsthal drew inspiration for Die Frau ohne Schatten (The Woman Without A Shadow) from the orientalism of The Arabian Nights and from Mozart’s Magic Flute; stage director Paul Curran and designer Kevin Knight hope to create a magical world that will evoke the theatricality of Cirque du Soleil, complete with stage flight. For the adventurous, this could be a fascinating introduction to opera, as could Doctor Atomic, John Adams’s very recent music drama about the days leading to the detonation of the first atomic bomb in the New Mexican desert in 1945. For non-operagoers who love Shakespeare, Lyric’s production of Verdi’s rollicking and merry Falstaff makes a fine first-opera fit. Russian-lit lovers can hear Tchaikovsky’s romantic realization of Pushkin’s verse novel Eugene Onegin in the final opera of Lyric’s season, whose performances will overlap with the source of perhaps the most recognizable phrase in all of opera: Rossini’s Barber of Seville (“Fi-ga-ro! Fi-ga-ro! Figarofigarofigaro!”) [pictured to your left, click to enlarge]. 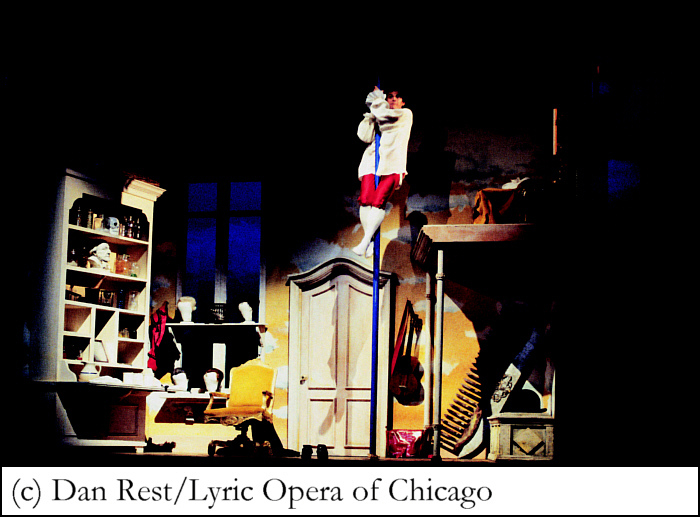 Lyric’s production designer John Conklin drew inspiration from the witty trompe l’oeil paintings of French surrealist René Magritte, which visually accentuate the opera’s fun factor. The Metropolitan Opera’s new high-def/surround-sound live Saturday afternoon broadcasts in movie theaters around the country are a wonderful new way to take a friend to the opera. The variable camera angles make the visuals outstanding, the sound systems are great, tickets are only $18, and it’s actual live opera. (Puccini’s Il trittico, three one-act operas staged by Broadway director Jack O’Brien, is scheduled for April 28.) In addition to the live TRITTICO broadcast April 28, there will be an encore in-theater broadcast of Tchaikovsky’s EUGENE ONEGIN pm April 15 (the same production that will be seen at Lyric in 2007-08, also starring Dmitri Hvorostovsky in the title role); and an encore in-theater broadcast of Rossini’s THE BARBER OF SEVILLE April 21 in Canada and May 15 in the U.S. In the Chicago area, the curious and adventurous can check out Chicago Opera Theater’s excellent productions of off-the-beaten-path works that span the centuries (Monteverdi’s Return of Ulysses, Bartok’s Bluebeard’s Castle and Schönberg’s Ewärtung, and Berlioz’s Béatrice et Bénédict, based on Shakespeare’s As You Like It). An intriguing new-fare option is Jake Heggie’s short chamber opera To Hell and Back (inspired by the Greek myth of Persephone, starring Patty Lupone and Isabel Bayrakdarian – who also sings on the Lord of the Rings soundtrack) at the Ravinia Festival this summer. There are several companies with summer opera seasons, including Santa Fe Opera, Glimmerglass Opera (in Cooperstown, NY), Opera Theatre of St. Louis, and many others, all serving a mixed buffet of classical and contemporary works. Surprise and delight await. Go check it out. And take a friend.